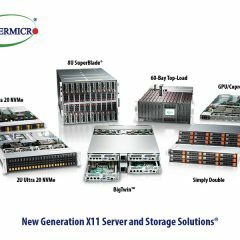 Supermicro - The leader in server technology innovation and green computing. 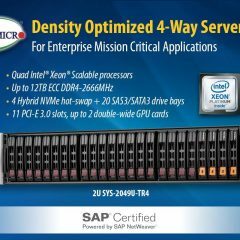 Super Micro Computer, Inc. or Supermicro® (NASDAQ: SMCI), a global leader in high-performance, high-efficiency server technology and innovation is a premier provider of end-to-end green computing solutions for HPC, Data Center, Cloud Computing, Enterprise IT, Hadoop/Big Data and Embedded Systems worldwide. 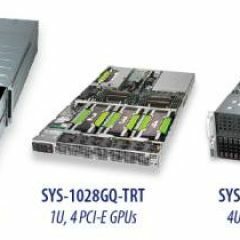 Supermicro's advanced server Building Block Solutions® offers a vast array of modular, interoperable components for building energy-efficient, application-optimized, computing solutions. This broad line of products includes servers, blades, GPU systems, workstations, motherboards, chassis, power supplies, storage technologies, networking solutions, server management software and SuperRack® cabinets/accessories. 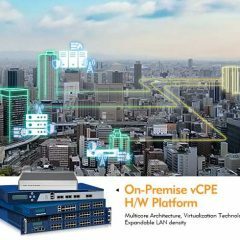 Architecture innovations include Twin Architecture, FatTwin™, SuperServer®, SuperBlade®, MicroCloud, Super Storage Bridge Bay (SBB), Double-Sided Storage®, Battery Backup Power (BBP®) modules, Universal I/O (UIO) and WIO expansion technology all of which deliver unrivaled performance and value. 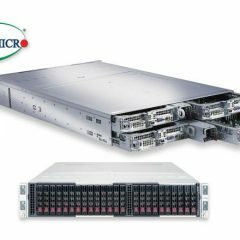 As a leader in energy efficient computing, Supermicro supports the Climate Savers Computing Initiative (CSCI) as a major member and Chair of CSCI APEC Region. CSCI’s goal is to promote development, deployment and adoption of smart technologies that can improve computer efficiencies and reduce global CO2 emissions by 54 million tons a year by 2013. The company’s products are earth-friendly and environmentally safe meeting or exceeding RoHS requirements. Supermicro’s motto is: We Keep IT Green™. [toggle title="Customer Satisfaction" open="no"]To ensure absolute customer satisfaction worldwide, Supermicro stands behind all of its products with a comprehensive warranty and replacement policy. Supermicro has highly responsive reseller channels and dedicated Technical Support teams available 24x7x365 to quickly resolve any support issues and RMA services.